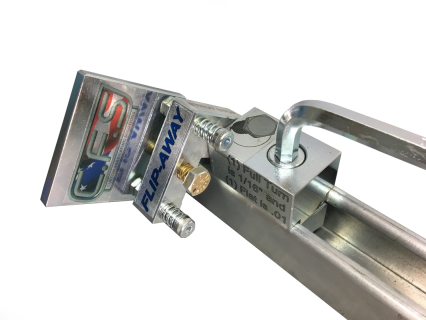 ​ 3 flats = 1/32"
1 full turn = 1/16"
One full turn = 1/16" and half a turn (3 flats) = 1/32"
Increase the length of your stop system using our EZ Speedy Extension! 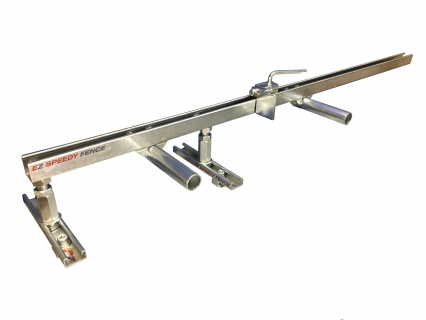 If you need your stops to travel a long distance then take a look at our EZ Speedy Extension! It comes with a 5 foot slotted strut, two rollers, a support stand, and a mending plate to easily increase the length of your strut rail. 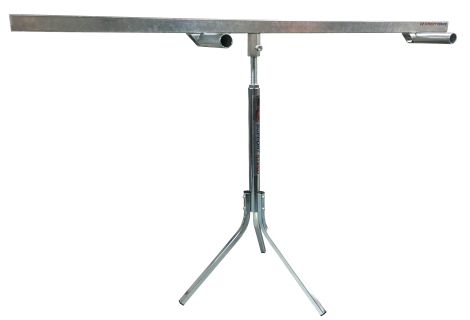 Plus when you don't need the length, the extension easily lifts off the support stand and can quickly be stowed out of the way of a shop's valuable floor space. All the adjustment points of the support stand use a 3/8 allen wrench just like the Flip Stop. One tool for the entire set up!! Buy multiple and save money! 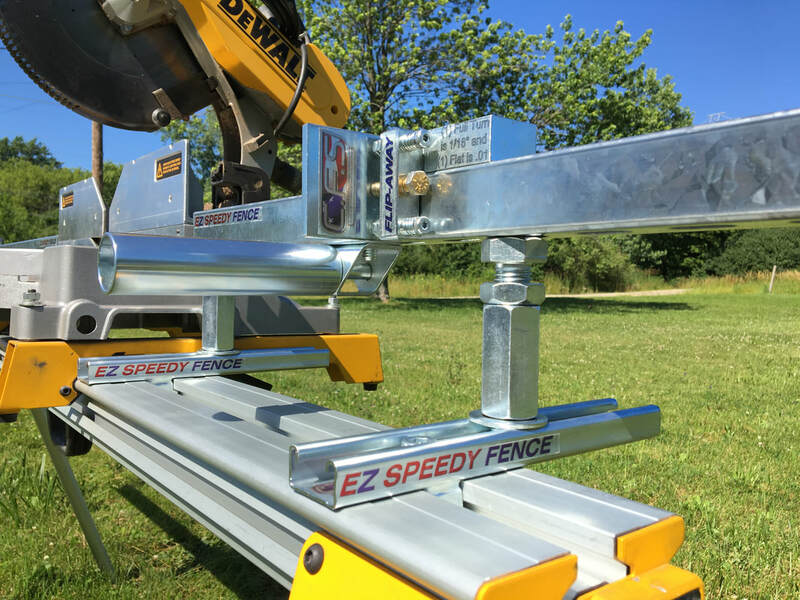 One full turn = 1/16"
This is a single spinning roller, the same one from the EZ Speedy Fence. This patented design is meant for the professional tradesman, the hobbyist, and everyone in between. 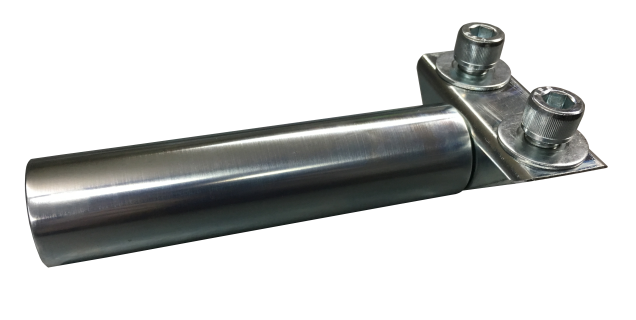 If you are an operator that would like the precision of a machinist’s stop with the flexibility of an open material table, this is the product for you. The wonderfully talented and hardworking people at CPI Daylighting have never expressed a significant problem with efficiency, per se, but the workers certainly appreciate the importance of using one's time wisely. As one of our best customers, CPI (builder of customized awning and natural-light structures) was happy to preview, review and purchase some of our first products. The company has since implemented the Flip-Away Strut Stop on multiple cutting stations and the Table Saw Fence Micro-Adjuster on two saws. While we have not yet received official reviews from CPI, their informal reviews have been glowing with praise for the product and its usefulness. The image to the right shows one Flip-Away newly installed on an existing strut rail. Other cutting stations needed custom machining in order to accommodate existing rails, but we were able to machine other Flip-Aways to fit their rail. NEW: Clear plating to protect and preserve! The Flip-Away is a Jack-of-all-trades without being a master of none: adaptability with accuracy, versatility with precision, repeat-ability with flexibility. The flexibility comes from the fact that the Flip-Away lets operators set a stop and walk away without tying up an entire machine. Simply set your coordinate, do your cutting and then flip the stop up and away when you leave. As long as nobody moves your stop (a tape mark helps) you can come back hours or days later with little or no time spent reacquiring your stop: it is already there! You can have multiple stops set, without stopping anyone from cutting. the Flip-Away can be used on either side of your saw. If you look closely at the video, you'll see that we have no less than 10 (and sometimes more) stops in the two 10ft. (right and left) rail segments. Something we've noticed about the Flip-Away from our use in the shop: since the stop can flip out of the way after clamping, our stop can prevent blade binding...If you clamp the [material] and then flip the stop...you stop stressing your blade....Then, when you are done with a cut, [remove the cut material], flip the Flip-Away back down, and get ready to cut again. In the long term, this [stop] has saved us time, material, and blades.